USAF Museum with the "Bockscar"
A huge museum of (mostly) US military aircraft, the star piece of which, from a dark perspective, has to be the "Bockscar", the Nagasaki A-bomber. But there are several other dark aspects/exhibits too. 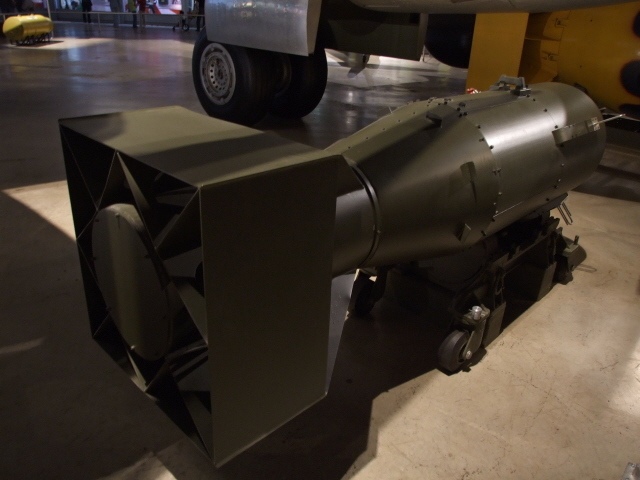 More background info: The "Bockscar", the item of most significance to the dark tourist that the museum has, was the plane that dropped the second (and last war-time) atomic bomb, namely on Nagasaki, Japan, three days after the first A-bomb was dropped on Hiroshima by the "Enola Gay". Both aircraft were specially adapted B-29 bombers and both survived WWII. 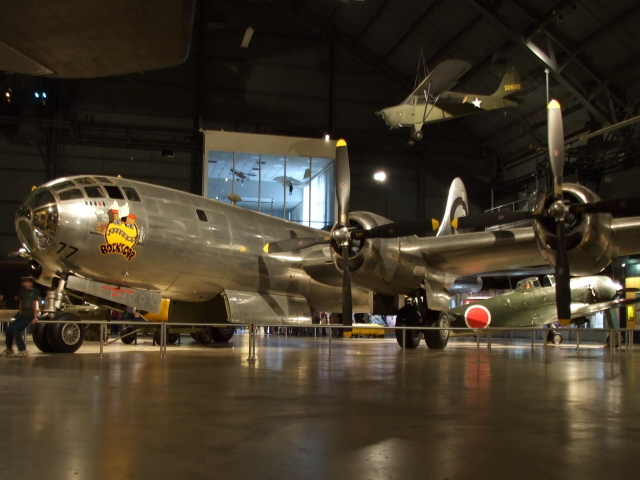 While the initial display of the "Enola Gay" at the Smithsonian in Washington D.C. triggered much controversy and ultimately had to be called off until it was moved to its new location, the display of the "Bockscar" at the USAF Museum, by contrast, doesn't seem to have caused any ripples in public opinion. This may partly have to do with the USAF Museum's location, away from the big East Coast cities and right next to one of the largest and most significant airbases in the USA: "Wright Patterson Air Force Base", in part named after the Wright brothers, the pioneers of heavier-than-air aviation, who used this area as a testing field. The historical importance of the Air Force Base also extends into modern-era politics – it was here that the Dayton Accords (or "Dayton Agreement") were signed that brought about an end to armed hostilities in the former Yugoslavia, in particular Bosnia-Herzegovina. The USAF Museum itself is also of historical significance, being one of the oldest (and now biggest) of its kind in the world. Its collections go back to the 1920s. 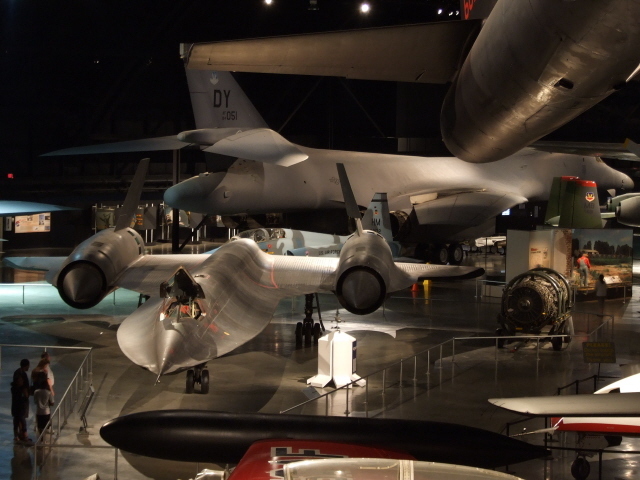 It became the Air Force museum proper in the 1950s and the present site was first established in 1971, but has been significantly expanded since then. Today, the museum houses over 400 aircraft, some of them extremely rare, plus several other exhibits relating to air and space flight technology as well as the history of military aviation from World War I, WWII, the Cold War to the present day. Officially, the museum these days bears the (registered) name "The National Museum of the US Air Force", but here the older name is retained for easier reference. 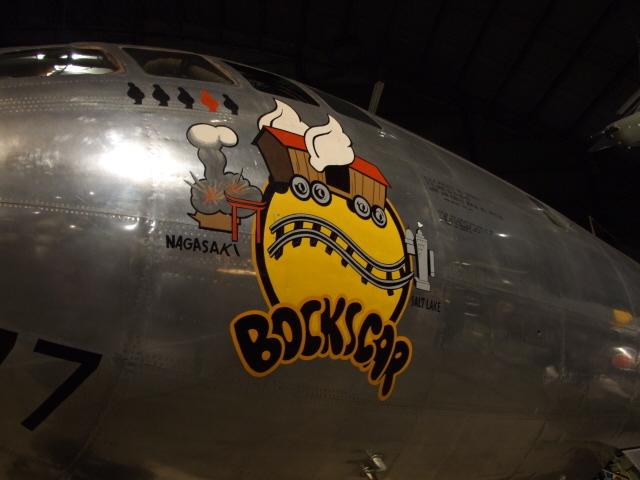 What there is to see: The main reason for a dark tourist to make it all the way out to Dayton in western Ohio is to see the "Bockscar", the genuine B-29 Nagasaki bomber. You'll find it in the "Air Power" gallery of WWII planes in the first hall immediately to the left of the main connecting corridor . To the right is the World War One gallery, and early flight sections. 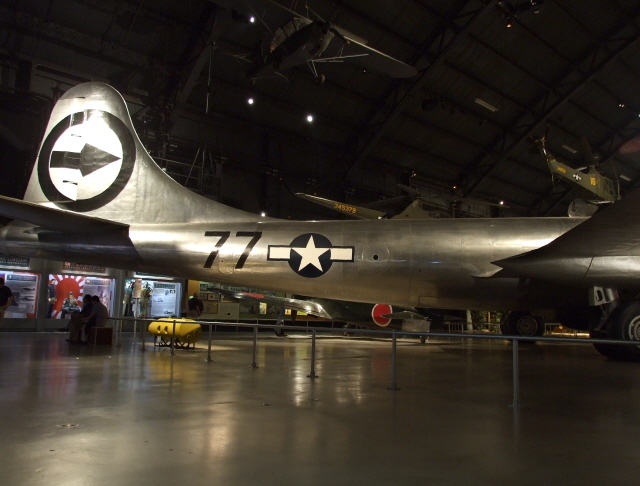 Unlike the "Enola Gay" at the Smithsonian's Udvar-Hazy Center near Washington, where the plane is simply one of many with no special treatment given to it that would do its historical significance justice, the "Bockscar" at the USAFM is positively celebrated, namely as "the plane that ended WWII". The details in the some of the accompanying text panels are somewhat less simplified than that. But the view is clearly maintained that the decision to drop the bomb was based on the reasoning that using a second A-bomb even after Hiroshima would finally bring the war to an end. Thus the need for an invasion of the Japanese homeland would be averted, which could have cost even more lives, not only on the part of the US but also amongst the Japanese civilian population. The historical evaluation of the whole story is a bit more complicated than this, and more controversial too (see under Nagasaki), but you couldn't really expect that to be discussed in ethical terms more deeply here. The details of the mission as such, on the other hand, are covered in quite some detail. 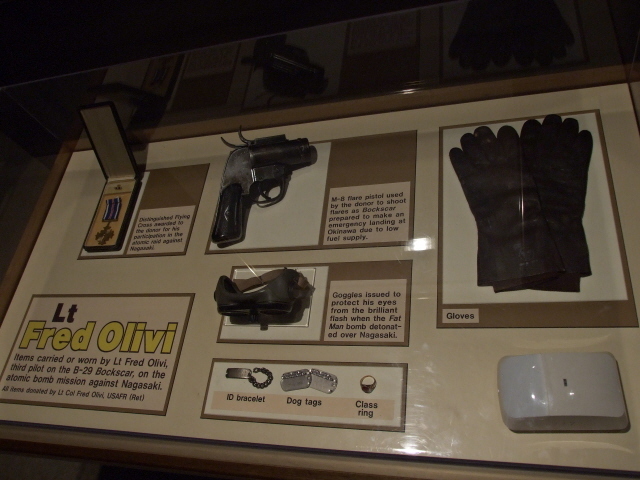 And apart from the wholly restored plane itself, including the somewhat comic-like picture on the port side exterior of the cockpit, smaller artefacts, such as gloves, goggles and "dog tags" worn by one of the crew members are also on display. 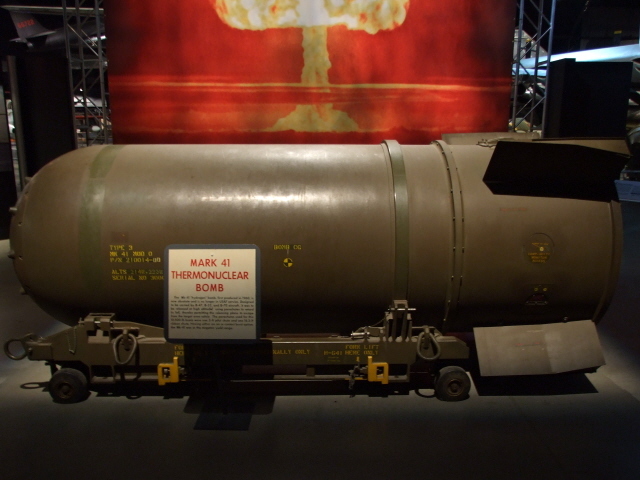 All this is augmented by replica A-bombs of both the "Little Boy" (Hiroshima) type and the almost ball-like shape of the "Fat Man" (Nagasaki) bomb – or rather the orange "pumpkin" bombs of the same shape and weight but with conventional explosives which were used for training in the run-up to the actual A-bombing mission. The rest of the WWII gallery contains various other bombers and fighter planes as well as informational photo-and-text-panels about e.g. the aerial bombardment strategies in the European "theatre" (I cannot bring myself to writing this questionable military euphemism without inverted commas), esp. with regard to Berlin. Somewhat dark are also the display of a trainer version of the Japanese "Ohka" purpose-built manned Kamikaze flying bomb (see Yushukan and Chiran) and a V-2 missile. The next of the three large main hangars of the museum is entitled "modern flight", but is mostly about the Korean War and the Vietnam War and surrounding conflicts. 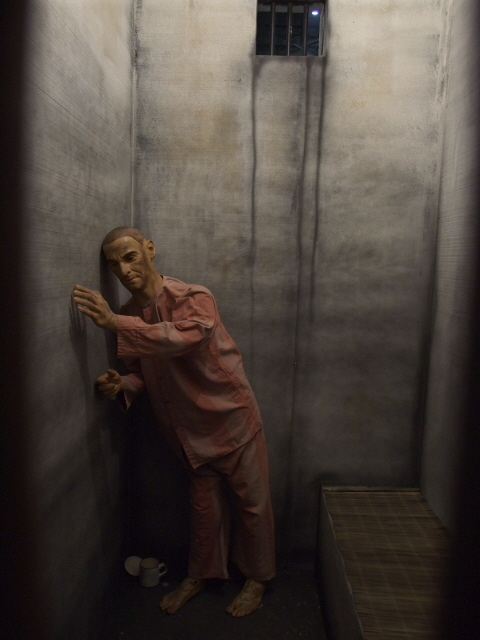 Of particular interest to the dark tourist, and not just military aircraft buffs, will be the section about American POWs in North Vietnam, especially at the infamous Hoa Lo prison, sarcastically nicknamed the "Hanoi Hilton". 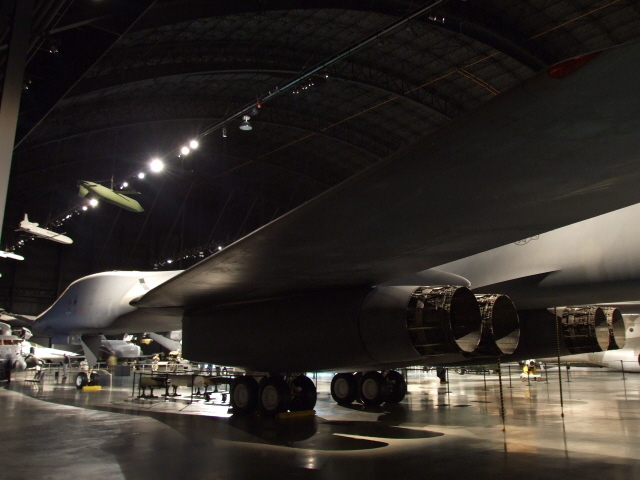 For its physical size alone, one of the most dominating exhibits in this section is however the complete B-52D. This type formed the backbone of the USAF strategic bombing fleet from 1952 and all through the 20th century … and in part beyond, even to the present day, some B-52s are still in operation. During the Vietnam War, these planes would have wreaked havoc on the ground like no other (see Vietnam, esp. 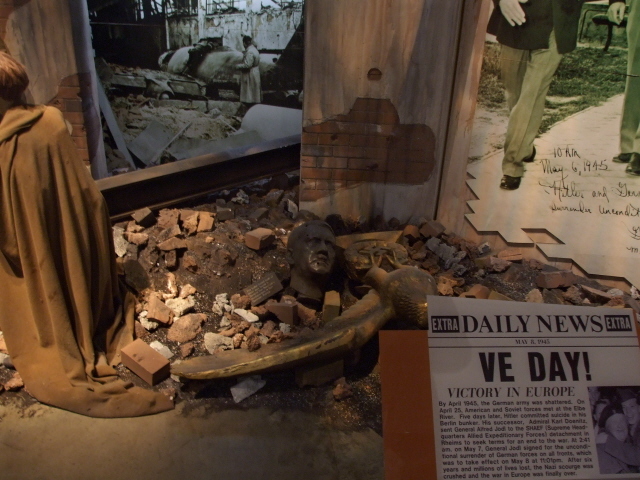 under the entries for the War Remnants Museum and the Vinh Moc tunnels). 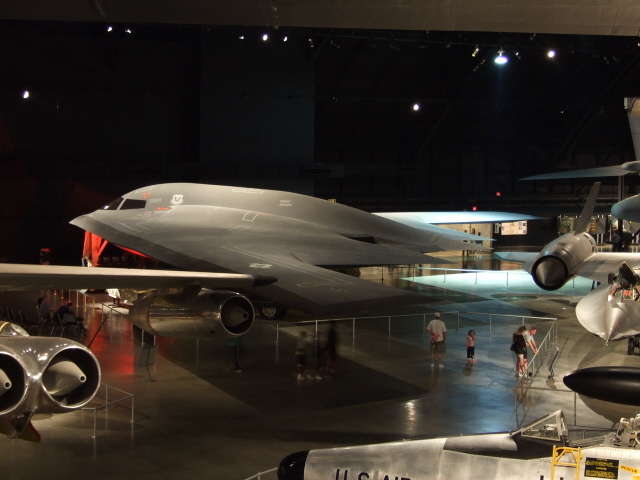 For a large part of the first half of the Cold War these heavy bombers were also the mainstay of America's nuclear deterrent until missiles took over that role. Thus the scene is set for what must be the second most significant part of the USAF Museum from a dark tourism perspective, namely the Cold War Gallery in the third hangar. In fact, from the point of view of potential, this is even scarier than the display of the actual A-bomber "Bockscar". Here replicas of various atomic and thermonuclear bombs show the development towards the world's military overkill capacity. Some of the earlier thermonuclear weapons were gigantic brutes, though size soon ceased to be a direct indication of destructive power. Very soon miniaturization would make even the deadliest items in the nuclear arsenal look rather harmless. 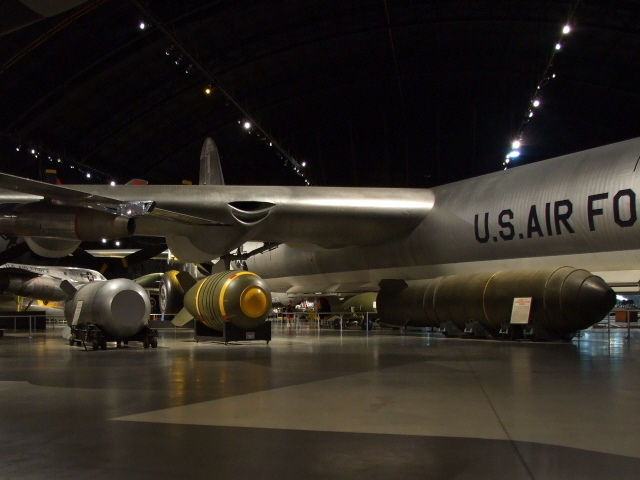 Similarly, the delivery vehicles also began to be reduced in size: the biggest one, that which could have carried the heaviest regular nuclear weapons of its day, the B-36 "Peacemaker" is a true brute itself, in fact the largest piston-engine war plane that's ever been in service. Its clumsy appearance is offset by the sleek elegance of the latest models of bombers such as the B-1B and contemporary B-2. 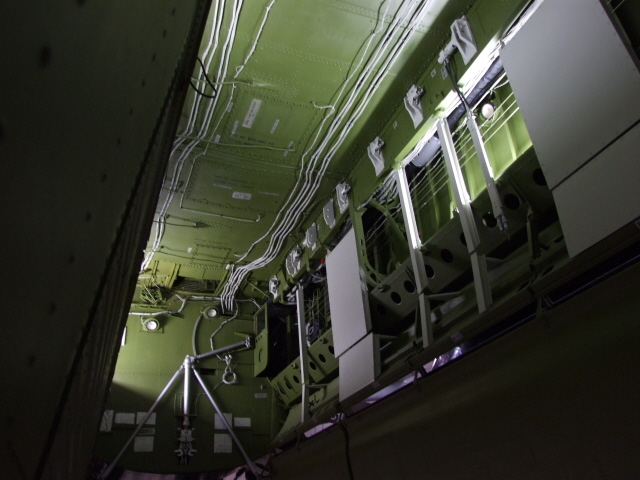 In comparison to these big aircraft, the modern-age cruise missiles that are suspended from the museum's ceiling look almost like toy planes. The same can, however, not be said about the main exhibits in the final section of the museum, the cylindrical annexe to the third hangar. Here, several full-size ICBMs are on display. 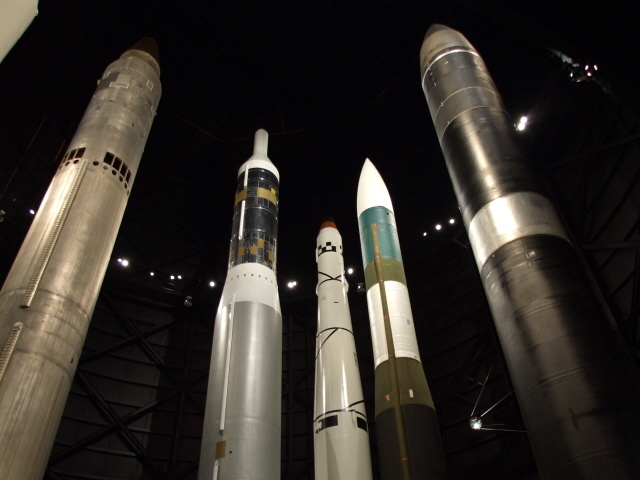 This includes a Minuteman missile – the type that was, and still is, the backbone of America's nuclear missile arsenal. 450 of the latest model Minuteman IIIs still remain operational – enough for an atomic holocaust followed by nuclear winter for sure. There's also a "Peacekeeper" missile, the most advanced ICBM ever – all of which are now decommissioned, however, as they were equipped with multiple warheads, which were phased out following post Cold-War arms reduction treaties, in particular START II signed in 1993 with Russia. Next to the missile there is also such a multiple warhead on display … its ten nuclear weapons, which could have been steered into different targets, look rather like outsized biro tips. You have to stand back and reflect a bit to get the scariness of these items of end-of-the-world technology. This is in a way helped along a bit by the statistics and specifications on the information panels that accompany the exhibits. 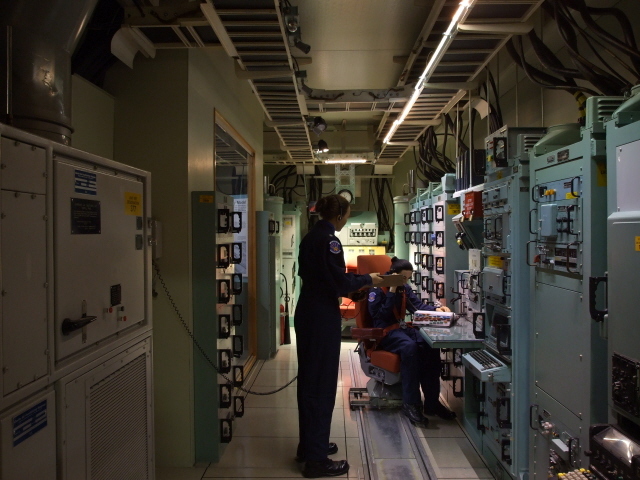 And especially by the training unit on display that is modelled on a real missile launching silo control room – such as the Minuteman silo in South Dakota. On what is supposed to be a more positive note, there's also a section of the Berlin Wall. As is customary in the USA, the fall of the Berlin Wall is offhandedly attributed to America's "winning" the Cold War, namely through its military might that the Soviet Union could no longer compete with. While there is without doubt some in truth in that, it was certainly nowhere near as important a factor as the reformist and non-confrontational approach assumed by the USSR's Mikhail Gorbachev from the mid-1980s. 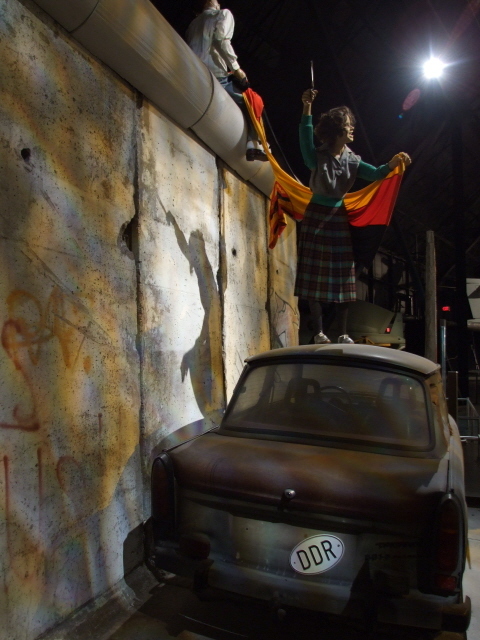 The museum actually has two Berlin Wall displays, next to each other: one is a short stretch of wall of the 4th generation complete with the rounded pipe top designed to make climbing over more difficult. In front of this a "Trabbi", the GDR's own iconic little passenger car, is parked and two dummy figures, one "riding" the wall, the other standing on the Trabbi's bonnet, "celebrate" their new-found freedom, in the Americanized fashion, i.e. by waving a flag … albeit not the Stars and Stripes but the German colours. The second piece of Berlin Wall consists of two sections painted in the familiar style of the perhaps most famous Wall artist, Thierry Noir. 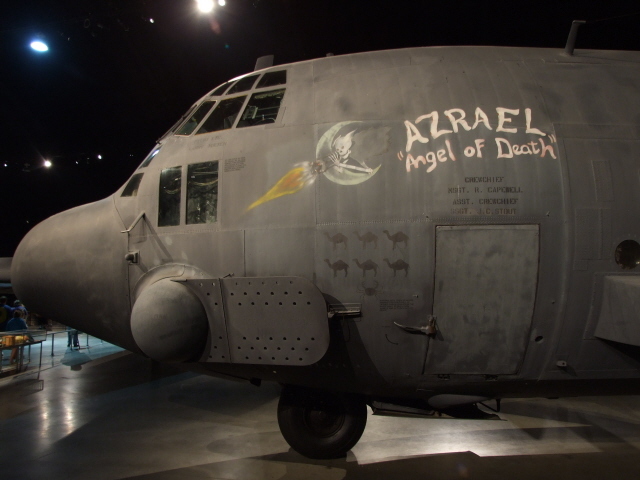 In fact, he personally painted these two sections for the USAF Museum … i.e. they are not original – which may explain why the paint is still so bright. 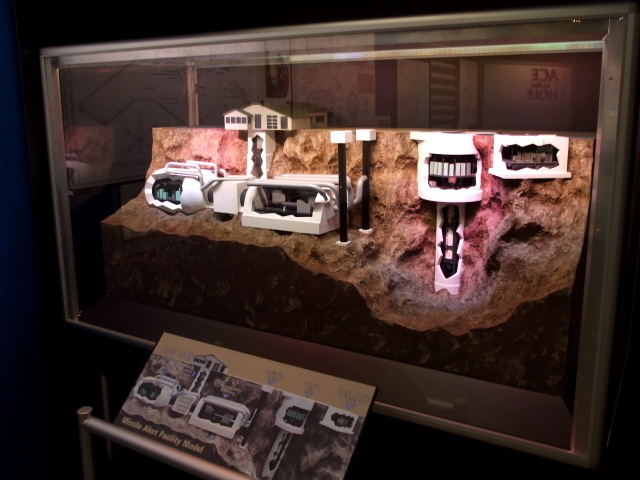 The original sections are said to be a gift from the Allied Museum in Berlin. The other sections were given to the museum in return for two vintage cargo planes of the type that were used during the Berlin Airlift. Finally, it should be mentioned that the post-Cold-War military engagements of the US, in particular in Iraq and Afghanistan, are covered too, although, as you might expect, in a somewhat less celebratory tone. 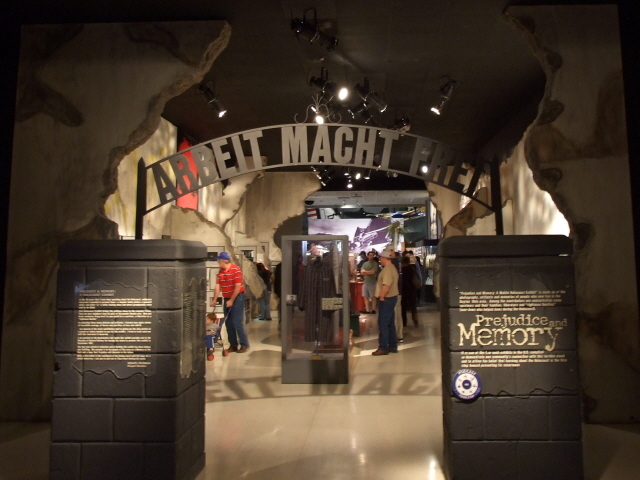 The museum boasts a huge shopping area, where items ranging from model planes to T-shirts and coffee mugs are on offer. The book section also has three different museum guides of different sizes costing from 6.95 USD to 16.95 USD. Location: on Springfield Street at historic Wright Field (Gate 28B), Wright-Patterson Air Force Base, six miles (10 km) north-east of Dayton, Ohio; address: 1100 Spaatz Street, Wright-Patterson AFB OH 45433, USA. Access and costs: easy to get to only by car, but a long drive from most places; free. Details: to get to the museum you need your own vehicle – and the time for driving all the way there, which can be significant, unless you happen to live nearby. Everyone else has to plan in a long drive on Interstate roads. From east or west Interstate 70 serves as the main motorway for getting to Dayton. At Dayton Fairborn take exit 43A for I-675 south. Take exit 15 for Col. Glenn Hwy, staying in the rightmost lane, then turning right into Col. Glenn Hwy., which shortly afterwards becomes Airway Rd. – you will already see the museum's hangars to your right. At the next intersection turn right into Harshman Ave and then take the next exit right, which will lead into Springfield St., from where the access road to the museum (well signposted) branches off to the right. Proceed past the open-air exhibit of planes and past the main museum entrance towards the parking lot for the general public. Parking is free of charge. Coming from the north, first go onto I-70 and go east and then as above. From the south, coming in on I-75, leave at exit 43 for I-675, then get off at exit 15, and proceed as described above. Opening hours: daily 9 a.m. to 5 p.m. (closed only on Thanksgiving, Christmas Day and New Year’s Day). Admission: free! (Parking too is free – unlike at the Enola Gay!). Time required: Even if you only want to see the decidedly dark bits you'll still need more than an hour for that, as even covering the distances requires time. I'd say the museum is well worth at least three hours, while still being selective. I skipped most of the early years, for instance, and concentrated more on the post-WWII sections, and still spent ca. 3 ½ hours there. For real aircraft and war tourism buffs, even a whole day may be too little. 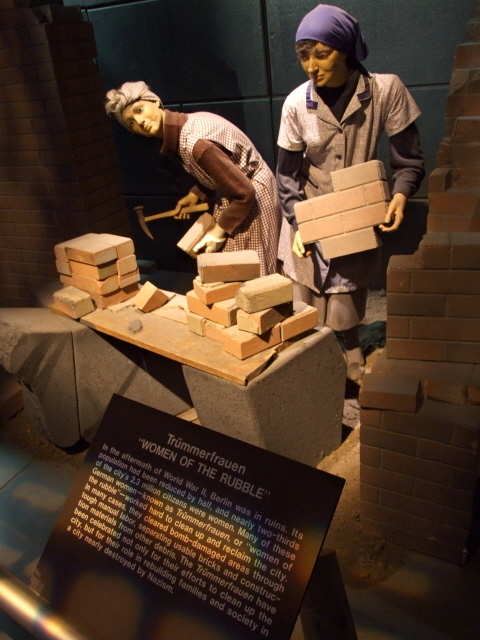 Combinations with other dark destinations: nothing in the immediate area – the "nearest" dark tourism site covered on this website would be the West Virginia Penitentiary, some 200 miles (320 km) to the east. For places even further afield check under USA in general. Combinations with non-dark destinations: The location of Dayton in western Ohio doesn't really make for much scenic splendour, though the city itself is said to be "pleasant". I can't tell, as I didn't even enter the city proper when I visited the museum in April 2010, after an overnight stay at a nearby motel I headed straight back east towards Harrisburg. Cincinnati to the south or Cleveland on the shores of Lake Erie to the north-east are probably more rewarding city destinations. Much of the inner Ohio countryside is uninspiring farmland.